In the first eight months of his pontificate, Pope Francis has impressed, charmed and inspired many people around the world with his outreach to non-Christians, his statements of concern for the poor and disabled, and his personal humility. At the same time, other Catholics have expressed dismay over the pope’s statements about homosexuality and his remarks that the church is “obsessed” with some social issues. Some news accounts contend that the pope’s popularity has created a “Pope Francis effect,” producing a “significant global rise in church attendance,” based on reports by Catholic clergy in Italy, Britain and and other countries of a recent rise in Mass attendance. In the United States, home to the world’s fourth-largest Catholic population, the pope appears to be well-liked by Catholics and non-Catholics alike, rated favorably by 79% of Catholics and 58% of the general public. 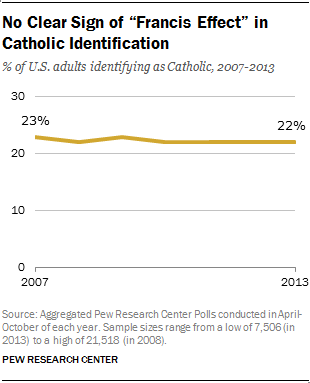 But has the pope’s popularity produced a Catholic resurgence in the U.S., where 10% of adults are former Catholics? Not so far, at least in terms of the share of Americans who identify as such, or the share of those who report attending Mass weekly. A new analysis of pooled Pew Research surveys conducted between Francis’ election in March and the end of October this year finds that the percentage of Americans who identify as Catholics has remained the same – 22% — as it was during the corresponding seven-month period in 2012. In fact, our polls going back to 2007 show Catholic identification in the U.S. has held stable, fluctuating only between 22% and 23%. Though Americans may report attending church more frequently than they actually do, our surveys find that self-reported levels of Mass attendance have remained virtually unchanged since the new pope was elected. 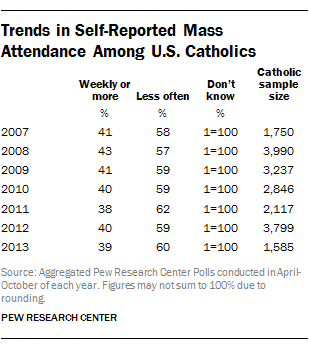 Since April of this year, 39% of U.S. Catholics report attending Mass at least weekly, similar to the 40% attendance figure last year.